Randy Fowler has send these pictures of his Cheetah, always one of my own favorite cars. I love how the chassis is built to follow the lines of the body. Great work, Randy! 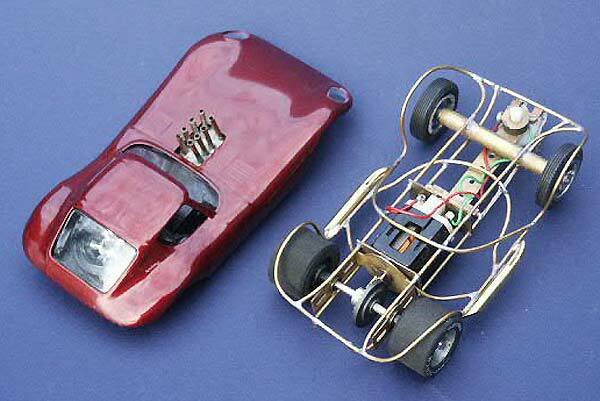 I started racing slot cars in the late 1950s. In 1962 a couple of guys in their 20s built a beautiful high-banked roadcourse in the small town of Lake Orion, Michigan, 40 miles north of Detroit (Jimmy Hoffa's summer home). That's where I grew up. I entered my first race there and came in third place with a Dyn-o-charger chassis, with a Ferrari Fiat body that I had bought with allowance money. My age was 12! From there I moved to other tracks in the area like Tom Thumb Raceway on Woodward Ave. Also there was a track on Dixie Highway in Drayton Plains that I can't remember the name of. I have owned almost ever car as they came out - you name it, I've owned it. The tracks I raced at sold most of the types of cars you see on e-bay today. I'm amazed they still exist. Even though the new stuff is fast, I enjoy the vintage cars simply because they are still three dimensional. I still like to spend time figuring out ideas and building them. I now live in Rockford, Michigan. We have a nice track 20 some miles away - I'm just happy we have one. Only three tracks left in Michigan that I know of. Middleville is where the track is, anyone is welcome. Chicago is too far except for a couple times a year, but worth the drive, with the tracks that are there! Above: The Cheetah is a Strombecker 1/24th body. They are nicer looking to me, and don't cost as much. The frame is a perimeter type, it has the advantage of no mounting holes! It pops into place within the hard body and stays put. The guys at the track, my age, gave me a lot of praise, which made me feel pretty good. Now I have to build them one - didn't see that coming! Above: I bought one of those Xenon lighting kits and installed it - works really well! My wife and I drove down to Chicago a few weekends ago and I took the Cheetah along. We visited Raceworld in McHenry. The Cheetah ran very well, better than expected. The next one will receive a better motor, maybe a super 16d. 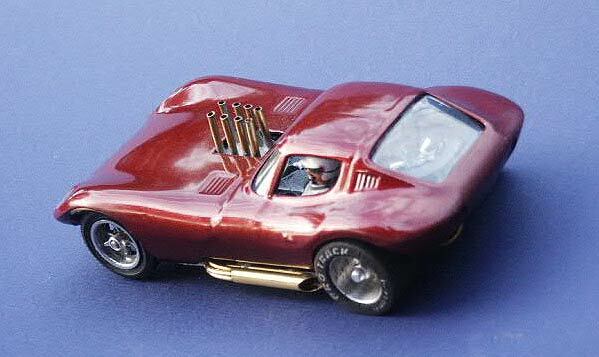 The brass Crower fuel injection and sidepipes are, like everything else, scratch built. I needed modern traction, so I decided on Protrack wheels on the back. The front are vintage stuff. I wanted big wheels on this one, so I made the compromise and filed the wheel wells, with good results.